Today, the Board of Trustees approved recommendations from Academic Program Review, a faculty-led, year-long process to evaluate every degree and degree track we offer. The review will allow us to increase resources in degree programs of greatest interest, opportunity and benefit to students. New degrees will be created, many will receive investment or continue as is, and some will be phased out. About 81 percent of our degrees and degree tracks will be expanded or go unchanged. The University of Akron is investing in some key areas of strength and opportunity, consistent with the results of Academic Program Review. The 32 full-time hires include twenty-three (23) tenure track faculty, eight (8) non-tenure track faculty and one contract professional to replace visiting faculty positions or to add depth and breadth to the University. The goal is to fill the positions for the fall 2019 semester. Ten (10) of these positions will be joint appointments in other UA colleges/schools to foster greater interdisciplinary collaborations. Below are the degrees and degree tracks that will continue and those that will be phased out. 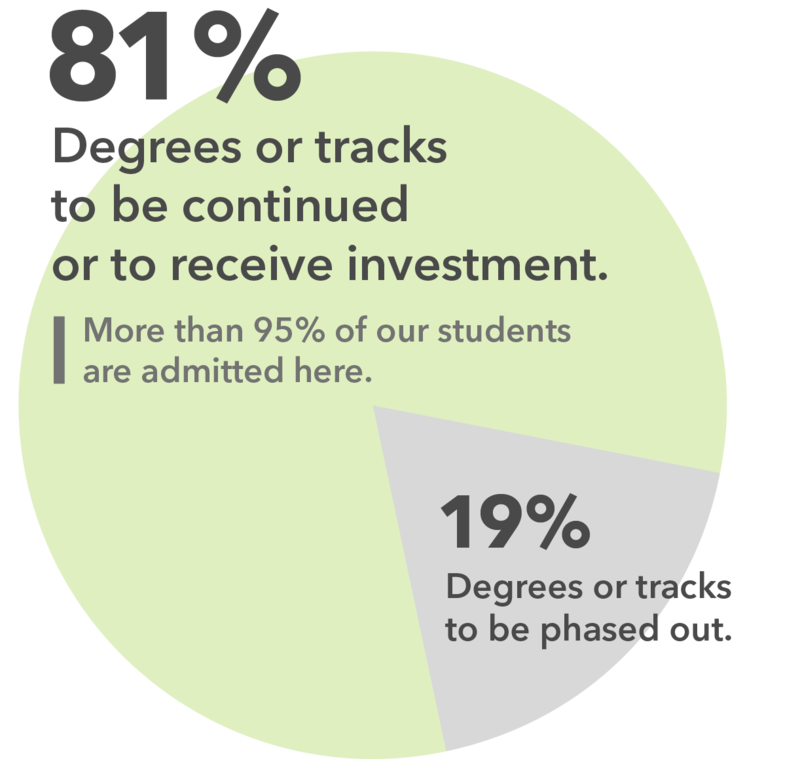 Phased out degrees and tracks are marked in gray, along with the rationale for the decision. Degrees to be phased out will remain active until all students in the program graduate (including those entering in fall 2018), but no new admissions to those degrees will be permitted. Arts & Sciences Psychology – Adult Development and Aging Small number of degrees earned; UA stipend lower than CSU's, a competitive disadvantage; suspend UA admissions while program continues at CSU. Arts & Sciences Sociology (joint with Kent State) Low number of degrees earned; significantly lower stipends than KSU; would require major investment in additional UA faculty and stipends to continue offering; suspend UA admissions while program continues at KSU. Health Professions Nursing-PhD (joint with KSU) Low enrollment and graduates in Ph.D. program. Doctor of Nursing Practice (DNP) degree continues. It has higher enrollment and fits better with practice profession focus and market demand. Suspend UA admissions while program continues at KSU. All law degree options will continue. Business Applied Mathematics/MBA Extremely low enrollment and very few degrees earned; reduction in graduate assistants (tuition remission / stipends) reduced enrollment. Other MBA tracks are stronger and will continue. Business Healthcare Management - MBA Other MBA tracks are stronger and will continue. Business International Business - MBA Low/declining enrollment and very few degrees; reducing graduate assistants (tuition remission / stipends) reduced enrollment. Other MBA tracks are stronger and will continue. Business Management - Business Analytics - MBA Other MBA tracks are stronger and will continue. Engineering Biomedical Engineering - MS Low enrollment and very few degrees earned. Polymer Science Polymer Eng/Applied Math BS/MSPE Extremely low enrollment and number of degrees earned. Arts & Sciences Art - History Emphasis - BA Very low number of degree majors-just 6 degrees earned from Fall 2014 to Summer 2017; other Art programs with higher priority for faculty hires. We will continue to teach art history so that students can meet General Education requirements. Arts & Sciences French - BA Very low enrollment and number of degrees; maintain minor. We will continue to offer courses in French so that students in other programs can meet degree requirements. Arts & Sciences Mathematics - BS BS in Applied Mathematics very strong. We will continue to teach many courses in math so that students in other programs can meet degree and General Education requirements. Arts & Sciences Natural Sci/Polymer Sci BS/MS Extremely low enrollment and number of degrees earned. Arts & Sciences Physics - BS Faculty evaluators found inadequate fulfillment of mission and low research activity; KSU has larger program with significantly more degrees granted. We will continue to teach courses in physics so that students in other programs can meet degree requirements.